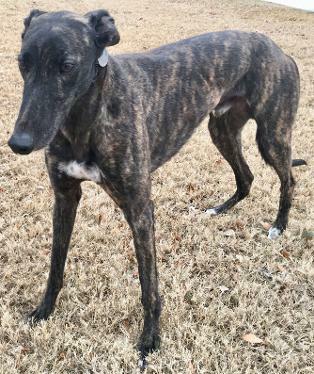 History: Van is a beautiful tall dark brindle boy. His racing career only lasted 50 races (all at the Southland track). It appears that he broke his right rear hock. It is now healed – his last race was in May, 2017. Van is a fairly laid back boy. He slept all the way from the farm to Dallas (except for bath time – he was a perfect gentleman and seemed not to mind at all). He is from a litter of only two pups of CTW Flirtatious (also dam of Angie) and CTW Base Camp. Today he weighed 69 pounds but his racing weight was 73 pounds. Van seems to be very affectionate and is already giving out kisses. 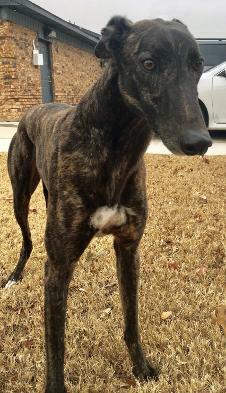 Congratulations to Van (now Aston) on his adoption into the Vickery family. 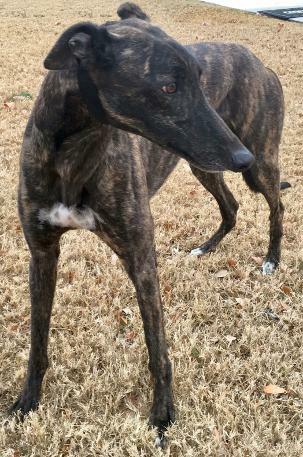 February 27, 2018 update: Van, now Aston (Aston Martin) has found his forever home with De, David and Greyhound sister, Marcie. Congrats to all!! 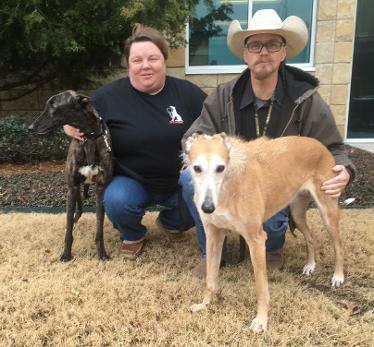 December 18, 2017 update: Van came to TAGS for a life of retirement and to find his loving lifetime home.